Copernicus could have got in a lot of trouble when he suggested that the Earth was not the centre of the universe. Somehow he managed to avoid getting embroiled in controversy (perhaps by dedicating his book to the Pope - what a creep) and it was poor old Galileo that took the heat the following century and was the focus of the church's wrath and ended up spending the last ten years of his life under house arrest like a seventeenth century Salman Rushdie. The church's reaction to the geocentric scientific beliefs of the day being challenged seems a bit over the top. What had it got to do with them anyway? It seems that they were getting ideas above their station, interfering in scientific circles, but of course back then you couldn't get a higher station than the church, and what's more they had the might to back it up. But, putting the church poking their oar in aside for the moment, you can understand why the old Ptolemaic system, whereby the Earth is immobile and sits at the centre of everything, seemed to make sense. It stood to reason. There it is, beneath our feet, solid as a rock, immobile. Anyone who trips over and falls down a flight of stone stairs has no doubt about that. And everything else - all those lights in the sky? They're quite clearly rushing around up there and are all obviously turning about the Earth. And it follows from this that as masters of Earth, mankind is obviously the most important thing in the universe. Don't put me down! Now we realise that this was all wrong and that far from being the centre of everything, Earth is insignificant, an invisible dot circling an invisible dot, infinitely small. How could we have been so arrogant to think that we lay at the centre of everything? Silly old people. We're so much more enlightened now, aren't we? Here in the present, at the centre of time. Grandfather assassination theory aside, it's generally held these days that now is the only time there is and that time travel is impossible. It stands to reason. Here we are, in the eternal present moving forward one day at a time whilst the past is dead, gone and set in stone, the future unknowable. I can't help thinking that this point of view is just as human chauvinistic as the old geocentric model of the universe. We've conceded the point that we're no longer at the centre of space, but still consider ourselves to be at the centre of time. Perhaps we need to be toppled from this position as well? Why should now be at the centre of time? Just because we don't appear to be able to move freely about in time doesn't prove a thing; Copernicus and Galileo didn't have to possess spacecraft to be right about their theories, why should we have to build a time machine? Of course we need a theory to go with this assertion. 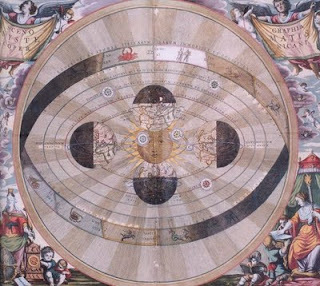 Will the temporal Copernicus please stand up?